Feeding an Australian Shepherd puppy the right food in the proper amount is essential to ensure they become a healthy adult dog. In this article, we explore how your Australian Shepherd puppy’s nutritional needs will change as they grow. We’ll also look at the benefits and drawbacks of different diets, how to determine if your puppy is the right weight, and what to do if he or she isn’t. On bringing your new Australian Shepherd puppy home, keep feeding the same food for at least two or three weeks. Dogs’ digestive systems are quite delicate and abrupt changes to their diet can result in tummy troubles. Canines don’t adapt to different foods the same way humans do and modifications to their food must be done gradually. When you do decide to change puppy food brands it should be done by mixing increasing amounts of the new food into the old for five to seven days. Start with mixing three-quarters of the current food with a quarter of the new food for the first two to three days. Then give him equal portions of the old and new food for the next two or three days. Finally, for the last two or three days, you should have three-quarters of the new food and one-quarter of the old food. By this time they should be acclimated to the new diet. If you see signs of an upset stomach, slow or stop the transition. Vomiting, diarrhea, excessive gas, or loss of appetite are signs to watch out for. When it comes to feeding an Australian Shepherd puppy, the right food plays a crucial role in their development. In the first few months of their life, they grow rapidly as their bones get bigger, muscles get stronger, and their immune systems develop. Growing puppies and young adult dogs actually need more calories than older dogs of the same size. A high-quality, nutrient-dense diet specifically formulated for puppies will support this accelerated rate of development. When searching for a puppy food, whole meat proteins like chicken, beef, and lamb should be listed as the first several ingredients. Healthy fats are a good source of energy for growing puppies while omega-3 fatty acids help to keep their skin and coat healthy. DHA (docosahexaenoic acid) is an omega-3 fatty acid known for encouraging strong brain development. Although commercial foods will offer feeding guidelines on their packaging, you may want to consult with a vet, since the optimal portion size can vary from puppy to puppy. Puppies should get three or four meals a day, but by the time they’re a year old they can be fed once in the morning and again in the evening. In terms of the amount, every dog’s metabolism is different. These medium-sized herders are known as an agile, rugged working breed. Descended from a line of Europe’s finest sheep herders, Australian Shepherds tend to have a high-energy level and require one to two hours of daily exercise. If your Australian Shepherd doesn’t run and play a lot, this should be taken into consideration. Dogs who aren’t as active require fewer calories. What Should you Feed an Australian Shepherd Puppy? When you’re walking up and down the pet food aisle in your grocery store the sheer amount of choice can be overwhelming. That’s not even including brands that are exclusively available through specialty pet stores or your veterinarian’s office. To make things even more complicated, there’s also home-cooked and raw diets to consider. Of course, each Australian Shepherd puppy diet has its own pros and cons. We’ll take a look at each one separately to help you make an informed choice. Dry kibble is without a doubt the most popular puppy food and it’s the easiest, cheapest, and most readily available option. As long as you’re choosing a high-quality brand that provides the proper nutrition for a growing puppy there’s nothing wrong with this choice. However, there are numerous brands of varying quality and many of the inexpensive ones won’t be as healthy. Some dry kibble can be loaded with cheap fillers and preservatives. The benefits of dry food include being easy to serve and store. Another plus is that it may help clean your puppy’s teeth. However, it’s not a substitute for regular teeth brushing. Although more expensive, many puppies will like the taste of canned wet food over that of dry kibble. So, if you have a puppy who isn’t eating, serving wet food might solve this problem. Other benefits are that it usually contains less preservatives, has a higher percentage of protein, and fewer carbohydrates than dry food. On the downside, it’s considerably more expensive and once it’s opened it can’t be stored for very long. Australian Shepherds who are fed wet food exclusively will likely need more attention paid to their teeth and gums. Another option is to combine dry and wet food as this gives them a semi-moist meal with the benefits of both kinds of food. Although some people choose to feed their Australian Shepherd puppy raw food, this diet is not without controversy. Before dogs were domesticated, they would eat raw meat and bones in the wild. However, a raw diet that includes raw chicken poses a risk of salmonella infection. Although a raw diet is packed with protein, it will have to be carefully balanced with other food sources to ensure nutritional balance. Whole bones can be a choking hazard. There’s also a concern that bone fragments can cause an intestinal blockage or internal puncture. If you feel that a raw diet is the right one for your Australian Shepherd puppy, it’s important to consult with your veterinarian to ensure it will meet their nutritional needs. Bear in mind that committing to a raw diet will require special preparation and storage requirements. Proper handling and cleaning practices will need to be used to reduce the chances of bacterial contamination. Choosing to feed your Australian Shepherd puppy a cooked homemade diet can be time-consuming. You’ll need to be extremely well-versed in all the nutrients a puppy needs to grow and develop properly. This is a big responsibility because even a small imbalance or deficiency can lead to health problems. Needless to say, always speak with your veterinarian about creating a proper meal plan before starting your puppy on a homemade diet. One benefit of a homemade diet is that it allows you to know exactly what ingredients you’re feeding your dog. How Much Should I Feed My Australian Shepherd Puppy? 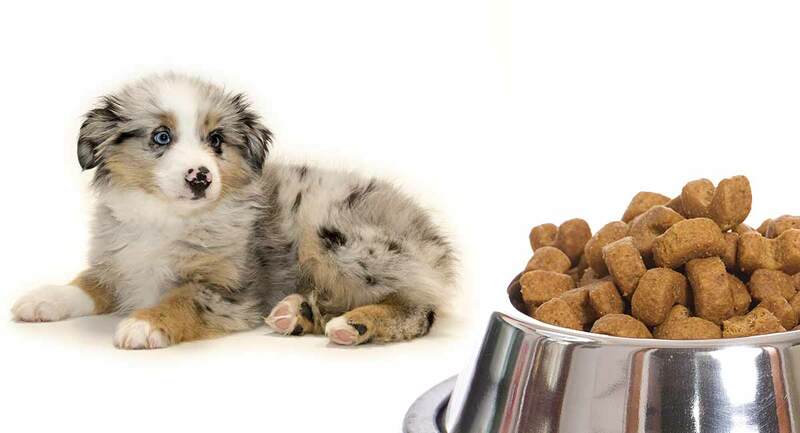 When it comes to how much you should feed your Australian Shepherd puppy there are a number of factors to consider. The puppy’s age, size, and activity level, as well as the type of food and brand, can make a difference in the amount of food they should get. As you can imagine, there’s a big variance in the amount of calories burned between a dog who’s out herding all day and one who lounges around the house. It’s important to be aware of your dog’s physical condition and keep track of their weight. Purina recommends that a dog in this weight range should get 2/3 to 2 cups of food per day when they’re between one and three months old. From four to five months of age, they should get 1 ¾ to 3 ⅓ cups. At six to eight months it should be 1⅓ to 3 ¼ cups. By nine to eleven months it increases from 2⅓ to 4 cups. Between the ages of one and two years old, they will get 2⅓ to 5 ¼ cups each day. Speaking with your veterinarian is the best way to ensure your puppy is eating the right amount. Is My Puppy the Right Weight? Despite being active, the Australian Shepherd has a hearty appetite and can put on weight quite easily. Australian Shepherds are also prone to hip dysplasia. This orthopedic disorder leads to lameness and painful arthritis and carrying around extra pounds can exasperate it. In addition to increasing the risk for hip dysplasia, being overweight also puts your puppy at a higher risk for heart-related problems, diabetes, and cancer. This article will give you more information about how much a puppy should weigh throughout his first year. But sometimes checking by eye and touch is a better way to gauge if your puppy is the proper weight. You should be able to feel his ribs easily by putting your hands on either side of his ribcage. And his abdomen should tuck in slightly when looking at him from the side. However, your puppy’s ribs shouldn’t be visible. If they are, he’s probably underweight. This could be a sign of a number of different underlying problems, especially if his appetite seems good. Parasites and hypoglycemia are two possibilities. If you suspect that your puppy is overweight or underweight, it’s time to take a trip to the vet. What if my Puppy is still Hungry? You’ve been following a proper meal plan and your Australian Shepherd puppy still seems to be hungry. This doesn’t mean he should be getting more food at mealtimes or even extra treats. Dogs love to eat and it’s not uncommon for them to be looking for more food even after they’ve just finished a meal. There are ways to get your puppy to slow down their eating. Feeding puzzles are designed to hide their food so that it’s impossible for them to gobble it down quickly. It makes a game of eating and provides mental stimulation at the same time. Giving your puppy smaller meals throughout the day is another option. What if my Puppy won’t Eat? When your new puppy refuses to eat, it can be quite disconcerting. While there’s always a possibility that they may be sick, there could be less serious reasons for them to turn away from food. If he won’t eat soon after you’ve brought him home, it could be that he or she’s just not used to his new surroundings and feels stressed. A little puppy will miss his/her mom and siblings until he adjusts. Teething pain could also cause him to stop eating. If you’ve only been giving him kibble, try wet food. Sometimes even just adding warm water to dry food can make it more appetizing. The reason they are not eating could simply be because they don’t like the brand of food you’ve chosen. The bottom line is that puppies can’t go very long without eating and drinking. If your puppy doesn’t want to eat for an entire day, get them checked out by the vet. How long is an Australian Shepherd seen as a Puppy? Larger breeds have a longer growth period than smaller breeds. The growth rate during the puppy stage also slows as they approach adulthood. A full grown male Australian Shepherd will stand from 20 to 23 inches and weigh from 50 to 65 pounds. Females measure 18 to 21 inches and weigh between 40 and 55 pounds. An Australian Shepherd will be their adult size by the time they’re approximately 10 to 15 months old. It’s important to remember that each dog is an individual and they can mature at different rates. Typically once your Australian Shepherd is an adult size they should be transitioned to eat an adult formulated food designed for medium to large dogs. If you’re unsure, stick with puppy food until your vet advises a food change. It’s better to feed an adult dog a puppy formulation than to start them on an adult dog food too soon. If you have any tips on feeding an Australian Shepherd puppy let us know in the comments.